In the Middle Ages and the Renaissance, every ring set with a precious stone was not considered as much a piece of jewelry, but more as an amulet that bestowed magical powers upon its wearer. An 18kt gold with natural sapphires and natural pearls, centered with a gold cameo plaque on which the beautiful form of a woman is engraved. Her cape is flowing as she walks, as is her lengthly hair. She is courtly and aristocratic. On the reverse the words in Italian "today and always, oggi e sempre". Golden curved shells and flowers surround her boundaries as do sapphire gems and natural pearls. Garlands form double strands around the central medallion. Sapphires are linked in long suspension from these strands. To fasten this around the neck, a mesh neckband, flexible and light. This appears to be a unique jewel made for a person of high position. Was it given to a woman by her lover, as a wedding gift, a promise? It is exceptional. Condition is superlative. Lore: Sapphire, one of the most precious world gems, is considered the gem of gems. It was always connected to royalty. 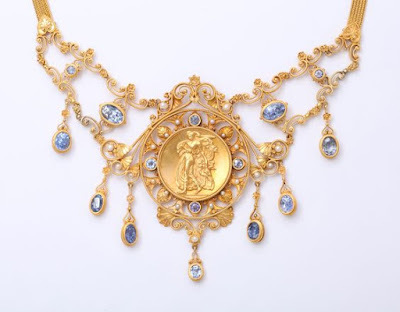 In medieval days, Sapphire was considered the height of hope and faith. Buddhists believe it brings devotion. Today is is the stone of royal wisdom.